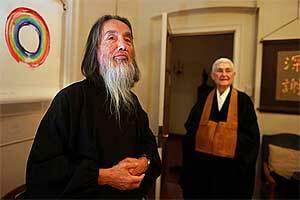 San Francisco, CA (USA) -- Kazuaki Tanahashi was still in his 20s, a self-described "arrogant kid," when he showed up at the Soto Temple in Japantown where a Japanese Buddhist priest was offering meditation lessons to a small but intense band of beatniks. << Kazuaki Tanahashi, shown at the San Francisco Zen Center, has just published an English translation of "Treasury of the True Dharma Eye" by the 13th century monk Dogen Zenji. The Berkeley resident began translating Dogen's work in 1960. Treasury of the True Dharma Eye" (Shambhala Publications; $150) is a monumental accomplishment, bringing together Dogen's essays on the essence of Buddhist teaching and detailed instructions on how to meditate or lead a monastic life, not to mention this medieval monk's paradoxical ponderings on the nature of time and space.